Family life is changing, and so, too, is the role mothers and fathers play at work and at home. 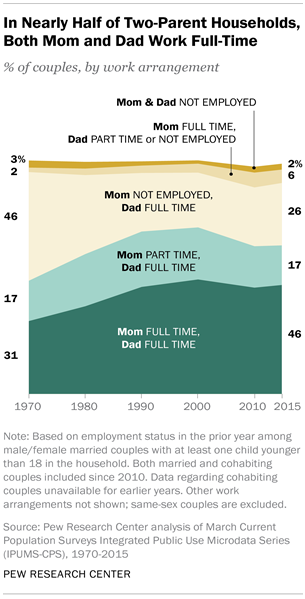 As more mothers have entered the U.S. workforce in the past several decades, the share of two-parent households in which both parents work full time now stands at 46%, up from 31% in 1970. At the same time, the share with a father who works full time and a mother who doesn’t work outside the home has declined considerably; 26% of two-parent households today fit this description, compared with 46% in 1970, according to a new Pew Research Center analysis of Current Population Survey data. In economic terms, families with two full-time working parents are better off than other families. The median household income for families with two full-time working parents and at least one child under 18 at home is $102,400, compared with $84,000 for households where the father works full time and the mother works part time and $55,000 for households where the father works full time and the mother is not employed. But as a new Pew Research Center survey shows, balancing work and family poses challenges for parents. In fact, more than half (56%) of all working parents say this balancing act is difficult. 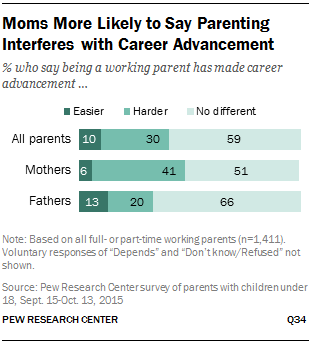 Among working mothers, in particular, 41% report that being a parent has made it harder for them to advance in their career; about half that share of working fathers (20%) say the same. The survey, conducted Sept. 15-Oct. 13, 2015, among 1,807 U.S. parents with children younger than 18, also shows that in two-parent families, parenting and household responsibilities are shared more equally when both the mother and the father work full time than when the father is employed full time and the mother is employed part time or not employed.1 But even in households where both parents work full time, many say a large share of the day-to-day parenting responsibilities falls to mothers. About half (54%) of parents in households where both the mother and the father work full time say that, in their family, the mother does more when it comes to managing the children’s schedules and activities; 47% also say this is the case when it comes to taking care of the children when they’re sick. 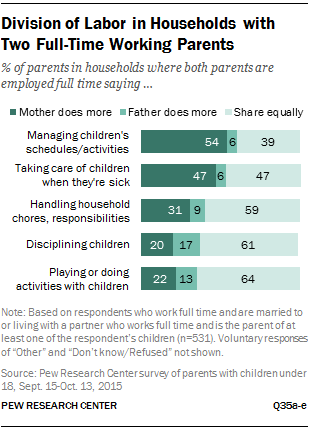 But most parents in this type of household say the mother and the father share tasks about equally when it comes to household chores and responsibilities (59%), disciplining (61%) and playing or doing activities with the kids (64%). In households where the father works full time and the mother works part time or not at all, the distribution of labor when it comes to childcare and housekeeping is less balanced. These moms take on more of the responsibility for parenting tasks and household chores than those who work full time. It is important to note, however, that there’s a significant gender gap in how mothers and fathers describe their household’s distribution of labor. Mothers in two-parent households, regardless of work status, are more likely to report that they do more on each of the items tested in the survey than fathers are to say their spouse or partner does more. For their part, fathers are generally more likely than mothers to say that these responsibilities are shared about equally. For example, 64% of mothers in two-parent households say that they do more than their spouse or partner when it comes to managing their children’s schedule and activities. 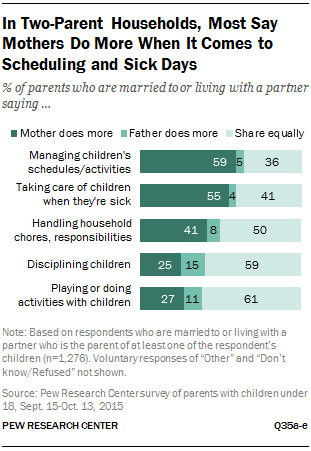 And while many fathers (53%) concede that the mom in their household does more of this than they do, dads are much more likely than moms to say this responsibility is shared equally (41% vs. 31% of moms). In households where the father works full time and the mother works part time, a 63% majority, including 71% of fathers and 57% of mothers, say that, in their family, the father is more focused on his job or career than the mother; about a third (32%) say both are equally focused and 4% say the mother is more focused. 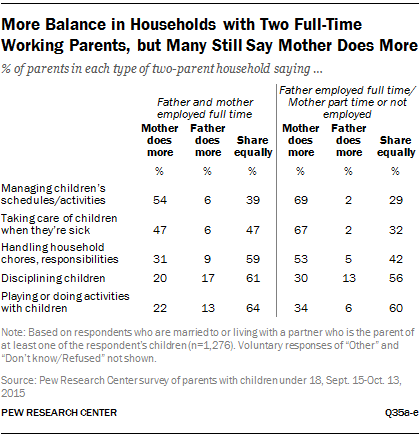 Across all two-parent households where both parents are employed at least part time, 59% say the father earns more than the mother, 17% say the mother earns more, and 23% say they earn about the same. Perhaps not surprisingly, 83% of parents in families where the father is employed full time and the mother is employed part time say the father earns more, while 3% say the mother does and 14% say they earn about the same. Yet, even in families where both parents work full time, half say the father is the top earner, while 22% say the mother is and 26% say they earn about the same amount. For many working parents, balancing their jobs and their family obligations can be a challenge. Among all working parents with children under age 18, more than half (56%) say it is difficult for them to balance the responsibilities of their job with the responsibilities of their family, with 14% saying this is very difficult and 42% say it’s somewhat difficult. There is a significant education gap in attitudes about balancing work and family, with college-educated mothers and fathers much more likely than those without a college degree to say it is difficult for them to balance the responsibilities of their job and their family. Among working mothers with a college or post-graduate degree, 70% say it is difficult for them to balance work and family life; 52% of mothers without a college degree say the same. Similarly, among working fathers, 61% of college graduates say this is difficult for them, compared with 47% of non-college graduates. These differences hold even when controlling for the fact that college-educated parents are more likely to work full time. There is also a racial gap in these attitudes. White parents are more likely than those who are non-white to say it is difficult for them to balance work and family.3 About six-in-ten (57%) white working fathers say this is the case, compared with 44% of non-white fathers. Among working moms, 65% of those who are white say it is difficult for them to balance the responsibilities of their job with the responsibilities of their family; about half (52%) of non-white working mothers say the same. For working parents, attitudes toward balancing their job and their family life are highly correlated with their experiences as parents. For example, parents who say it is hard for them to strike the right balance between work and family are far less likely than parents who don’t to report that being a parent is enjoyable all of the time (36% vs. 50%). And by a narrower but significant margin, working parents who find it hard to balance work and family are also less inclined than those who don’t to say being a parent is rewarding all of the time (48% vs. 57%). While balancing work and family life can be difficult for many working parents, the survey suggests that being a parent doesn’t necessarily interfere with career advancement. When asked if being a parent has made it harder or easier to advance in their job or career or if it has had no impact, a majority (59%) of working parents say it has not made a difference. Three-in-ten say being a parent has made it harder for them to advance at work, and one-in-ten say being a parent has made it easier. These overall numbers mask the disproportionate impact women say being a working parent has on their careers. Mothers are twice as likely as fathers to say being a working parent has made it harder for them to advance in their job or career. About four-in-ten working mothers (41%) say this, compared with two-in-ten working fathers. And mothers who work part time are just as likely as those who work full time to say being a working mother has made it harder for them to move ahead in their job. For working mothers who have a spouse or partner who is more focused on his job than they are, being a working parent may have more of an impact on career advancement. About half (48%) of working mothers who say their spouse or partner is more focused on his work also say being a parent has made it harder for them to get ahead at work. By comparison, 30% of mothers who say they and their spouse or partner are equally focused on their careers say being a working parent has made it harder for them to advance in their job. Most parents, including at least eight-in-ten mothers (86%) and fathers (81%), say they feel rushed at least sometimes. But for many mothers who work full time, feeling rushed is an almost constant reality. In fact, four-in-ten full-time working moms say they always feel rushed, even to do the things they have to do; an additional 50% say they sometimes feel rushed and just 10% never feel rushed. In comparison, about three-in-ten mothers who are employed part time or not employed say they always feel rushed (29% in each group). But while 61% of moms who are employed part time say they sometimes feel rushed, fewer of those who are not employed (49%) feel similarly. In turn, mothers who do not work outside the home are about twice as likely as those who do to say they never feel rushed. Full-time working moms are also more likely than mothers who are employed part time or not employed to say they spend too little time with their children and to say they don’t have enough time away from their children to get together with friends or pursue hobbies or interests. And among those who are married or cohabiting, mothers who work full time are more likely than other moms to say they spend too little time with their partners. About four-in-ten (39%) mothers who are employed full time say they spend too little time with their kids, while 58% think they spend the right amount of time and just 3% say they spend too much time with their kids. At least seven-in-ten mothers who are employed part time (77%) or not employed (72%) say they spend about the right amount of time with their children, while 18% and 11%, respectively, say they spend too little time. About one-in-six (16%) mothers who do not work outside the home say they spend too much time with their kids; fewer (6%) of those who work part time say the same. Among those who are married or cohabiting, 44% of mothers who work full time say they spend too little time with their partners, compared with 27% of moms who are employed part time and 34% of moms who are not employed. At least half in each group say they spend the right amount of time with their partners, while few say they spend too much time. Fathers who work full time are no more likely than those who work part time or are not employed to say they always feel rushed (29% and 27%, respectively).4 But fathers who are employed full time are somewhat more likely than other dads—and more likely than full-time working moms—to say they spend too little time with their kids. Half of full-time working dads say this, compared with 41% of dads who are employed part time or not employed and 39% of full-time working moms. When it comes to leisure time, about half or more of all parents—whether they are employed full time, part time, or not employed—say there’s not enough of it. Full-time working mothers are somewhat more likely than other mothers to say this is the case; about six-in-ten (59%) say they don’t have enough time away from their children to get together with friends or to pursue hobbies and other interests, compared with about half of mothers who are employed part time (48%) or are not employed (47%). Among fathers, the same shares of those who work full time and those who work part time or are not employed say they don’t have enough leisure time away from their children (53% each). Most parents who are married or living with a partner with whom they share at least one child say that, in their household, the mother does more than the father when it comes to certain tasks related to their children. In particular, roughly six-in-ten (59%) say the mother plays a larger role in managing their children’s schedules and activities, while just 5% say the father does more and 36% say the parents share this responsibility equally. Similarly, when it comes to taking care of sick children, 55% of married or cohabiting parents say the mother does more than the father; just 4% say the father does more, and 41% say both parents share this equally. Mothers also tend to take on more household chores and responsibilities; 41% of married or cohabiting parents say this is the case in their households, compared with just 8% who say the father does more. Half say they and their partner share household chores and responsibilities about equally. The division of labor between mothers and fathers is more even when it comes to disciplining and playing or doing activities with children. A quarter of married or cohabiting parents say the mother plays more of a disciplinarian role in their families, while 15% say the father does, and 59% say both share this role equally. About as many (27%) say the mother does more when it comes to playing or doing activities with their children; 11% say the father does more, and 61% say both play or do activities with their children about equally. In households where both parents work full time, mothers and fathers tend to share some responsibilities more equally. For example, about six-in-ten (59%) parents in these households say this is the case when it comes to household chores and responsibilities. Still, about three-in-ten (31%) say the mother takes on more of this, while 9% say the father does. And while 47% of parents in two-parent households where both the mother and the father work full time say they and their partner play about an equal role when it comes to taking care of sick children, the same share says the mother does this more than the father. Just 6% in this type of household say the father does more. Parents in households where both parents work full time report that mothers are doing more than fathers when it comes to managing their children’s schedules and activities. Some 54% say the mother does more in this area, while 6% say the father does and 39% say parents share this responsibility about equally. Perhaps not surprisingly, in households where the father is employed full time and the mother is either not employed or is employed part time, childcare responsibilities usually fall to the mother. For example, about two-thirds of parents in these households say the mother does more when it comes to managing the children’s schedules and activities (69%) and caring for them when they’re sick (67%). Mothers and fathers in two-parent households differ in their perceptions of how they split certain responsibilities. The gap is especially pronounced when it comes to household chores and responsibilities. Half of mothers in two-parent households say they do more than their partners in this area, compared with 32% of fathers who say their wives or partners do more. 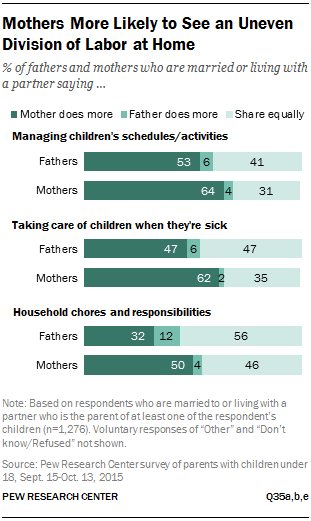 Fathers, for their part, are more likely to say they and their partners share household chores and responsibilities about equally: More than half (56%) say this is the case, while 46% of mothers agree. Similarly, while about six-in-ten mothers say they do more than their partners when it comes to managing their children’s schedules and activities (64%) and taking care of their children when they’re sick (62%), fewer fathers agree that, in their households, mothers do more in each of these areas (53% and 47%, respectively). In these areas, too, fathers are more likely than mothers to say they and their partners share responsibilities about equally. To varying degrees, these gender differences in perceptions of who does more are evident in two-parent households where both parents work full time as well as in households where the father is employed full time and the mother is employed part time or is not employed. Where there are differences, mothers are more likely to say they do more than fathers are to say that their partner does more, while fathers tend to say responsibilities are shared about equally. 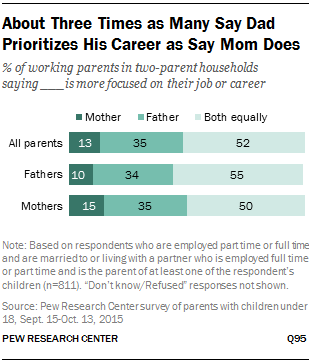 In households where both the mother and father are working at least part time, about half (52%) say that both are equally focused on their job or career. Where there is an imbalance, parents are nearly three times as likely to say that the father in the household is more focused on his career than the mother is focused on hers (35% vs. 13%). 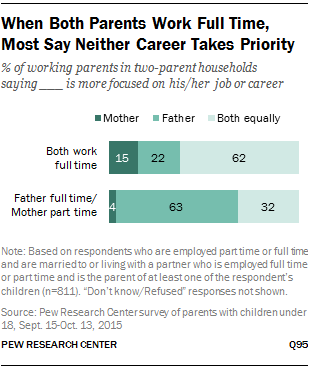 Mothers and fathers in these households generally agree about who is more focused on work. For example, 10% of fathers say their spouse or partner is more focused on work and 34% say they are more focused. Among mothers, 15% say they are more focused on work, while 35% say their spouse or partner is. Among full-time working parents with a spouse or partner who also works full time, most (62%) report that mom and dad are equally focused on their careers. Only 15% of parents in these households say that the mother is more focused on her job, and 22% say the father is more focused on his job. The situation is much different in households where the father works full time and the mother works part time. A majority of parents (63%) in these households (71% of fathers and 57% of mothers) say the father is more focused on work than the mother is, while 32% say they are equally focused and just 4% say the mother is more focused than the father. Among fathers in two-parent households, there is a significant racial gap in terms of how focused they say they are on their job compared with their spouse or partner. White fathers (39%) are much more likely than non-white fathers (19%) to say they are more focused on their career than their spouse or partner is. Among non-white fathers, a solid majority (69%) say they and their spouse or partner are equally focused on their jobs, compared with half of white fathers. Who Earns More in Two-Parent Households? While half of working parents say they and their spouses or partners are equally focused on their careers, the same is not true when it comes to compensation. Only 26% of parents in households where both parents work full time say they and their spouses or partners earn about the same amount of money. Half say the father makes more, and 22% say the mother makes more. In the Pew Research survey, among mothers in two-parent households, those who work full time (24%) are more likely than those who work part time (4%) to report that they earn more than their husband or partner. Even so, 44% of full-time working mothers in two-parent households say their spouse or partner earns more than they do; 32% say they earn about the same amount. Among part-time working moms, 78% say their husband or partner earns more than they do. Similarly, working mothers with a college education are more likely than those who have not finished college to say that they out-earn their spouse or partner (23% vs. 8%). About half (51%) of college-educated working moms say that their spouse or partner earns more than them, and 25% say that they earn about the same amount. In households where parents report that they are equally focused on their careers, half (50%) say that the father earns more than the mother. Some 18% say that the mother earns more in those households, and 30% say they earn about the same amount. In households where the father is more focused on his career than the mother, 84% say the father earns more, 5% say the mother earns more and 10% say they earn about the same amount. In families where the mom is more focused on her career than the dad is on his, a plurality (46%) say the mother earns more; three-in-ten in these households say the father earns more, and 24% say they earn about the same amount.